What do you miss from New Zealand while you are overseas? For me, it is neither Marmite nor Weet-Bix*, nor L&P nor Vogel's (oh all right, maybe Vogel's), but something that did not really originate in New Zealand at all: that highly seasonal little green fruit known as the feijoa. * By the way, did you know that these two kiwi favourites are made by Sanitarium, which has a tax-exempt status because it is owned by a religious organisation, the Seventh Day Adventist Church? This "charitable business" is actually very good at marketing, with news of our "marmageddon" spreading as for as the UK. And remember that jingle which goes "Kiwi kids... are Weet-Bix kids"? Apparently, in Australia they had the same advertisements, only they sang "Aussie kids... are Weet-Bix kids"! I have always thought of the breakfast cereal as a New Zealand product, but it turns out it was invented in Australia. Native to the highlands of South America, this aromatic fruit plays on your heartstrings like no other. If you have a feijoa tree, you will have more than you can give away for a month or two, to the point where you get sick of their unique juicy sweetness. Then just as quickly, your supply runs out, and you are left longing for your next feijoa for most of the year. If you don't own a tree yourself, however, and don't have a desperate friend or neighbour trying to get rid of their excess stock, then you are forced to pay up to $13.99/kg at the supermarket. Such is the divide between the haves and the have-nots. Vertical and horizontal cross-sections of feijoas. While I love feijoas eaten fresh, in a crumble, or in a cake (I particularly enjoy this spiced feijoa cake with crumble topping), I wanted a way to save their fragrant flavour for later. Obviously, you can freeze the pulp, and use it for making ice cream or baking. My in-laws pickle the small ones whole (just minus the tops) in a secret solution of what might be salt and vinegar. Or you can use the traditional fruit preservation method and turn it into a jam (if you are ever in France though, and the waiter doesn't understand what you mean by jam, don't think "preserve" and ask for préservatif or you will get some very strange looks indeed). I decided that I wanted to make feijoa cider. After all, the first one I ever had, thick and strongly alcoholic at the Wine Cellar four years ago, was a deliciously memorable experience. Put 1.5kg of feijoas in a bucket (cut off any bad bits first, and I usually remove the tops, too). Squash enthusiastically. Add 6.5 l of cold water, stir and cover. Stir 2x a day for a week. Strain out solids and mix in 1 kg of sugar and the juice and rind of 3 lemons. Leave overnight. Strain and bottle in clean PET bottles (I usually fill 3/4- 4/5 of the bottle then squeeze out the air before capping). Drinkable after 2 weeks. Open with caution. I didn't actually follow it to the letter. I couldn't bring myself to put the skins in as well, for instance. It looked like a pretty loose recipe anyway, so I had no qualms about using a stick mixer instead of squashing the fruit, or brown sugar instead of white. I also unscrewed the bottle cap ever so slightly once in a while, to let out some of the trapped gases. 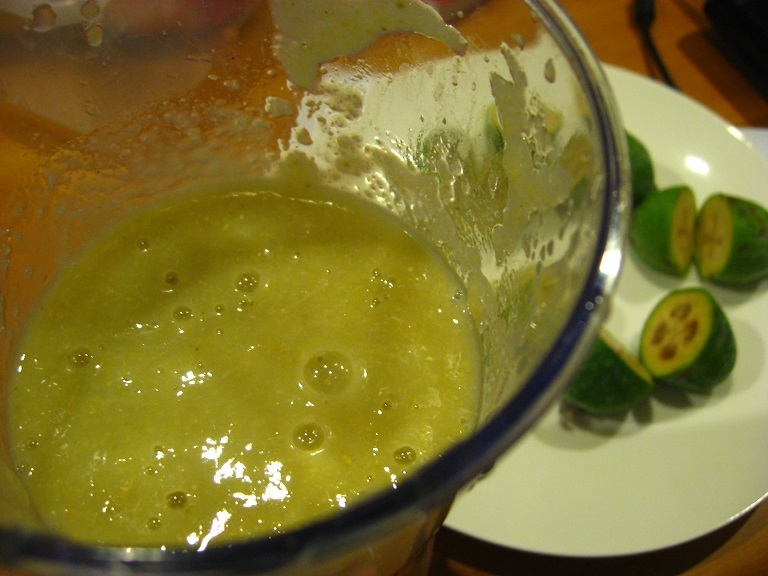 Feijoa pulp, blended with a stick mixer, and some cut feijoas in the background. I tasted the drink after a month or so, and let's just say it was nothing like the feijoa cider from the Wine Cellar. This was basically a rather sweet lemonade, in which the scent of feijoa was all but gone. I shall leave it for longer to see if more of the sugar will convert to alcohol, but I do not have high hopes. I will have to wait till next year before I have enough feijoas again to try Linda Isbister's recipe. In the meantime, I guess maybe I should read up on proper brewing technique. This post is part of Our Growing Edge, a monthly blogging event aimed at inspiring us to try new things. This month it is hosted by Sonya from And More Food. hello! and thank you for this lovely entry into this month's our growing edge. I've got it up in my round-up here. I'm sorry the feijoa taste wasn't strong enough - but I'm sure it was still pretty good? I've actually never had a feijoa - are they a tangy sort of fruit? If you like sugary lemonade, you would like my cider. It's hard to describe the flavour of feijoa, but it is tangy as well as sweet. You should try some one day! I found your blog searching for a feijoa wine recipe which doesn't use added water - we made feijoa wine but the flavor was very mild and our neighbor - a ''proper'' winemaker - told us that to get the real flavor we should use pure fruit juice. I would use frozen thawed feijoas but I think after draining the juice there would be more pulp than juice. Still searching . . .
Yeah, I was thinking that it would be very thick. Unless you strained the pulp out somehow? Let me know if you come across a good recipe! Today's question: Do you know, where can I buy feijoa jam in Auckland? It's not something I would look for, but you can try souvenir shops like Aotea, which has a branch at the bottom of Albert Street. Failing that, you could try ordering online? Or making some of your own? You definitely need the right equipment/yeast for your wine. What's the main difference between wine and cider, from someone who knows very little? Thanks for your recipe, my wife makes gin so I am lucky to have all the equipment to ferment it and then bottle it. I pulped it as you did but included the skins and I think having tasted it they add a good complexity. I added ginger but will put in a bit less and a bit less lemon for the next batch as it detracted slightly from the feijoas. The batch I did today I grated the fruit while still partially frozen using the food processor so it didn't pulp too much as straining the previous pulp was really painful and the cider is still quite cloudy. Time will tell if its better or not. The alcohol measured 6.8 but I didn't know to note the starting temp as well as the sugar level so it will be rough. Needs time in the bottle for secondary fermentation for carbonation but tasted pretty good!